A palace spokesman has claimed that President Duterte’s opponents are plotting a destabilisation attempt to coincide with the martial law anniversary this month. Speaking in a radio interview today (Monday, September 10) Harry Roque said “yellow” [liberal] forces were “addicted to power” and could still not accept defeat in the last presidential elections. “I know that they are planning a massive destabilisation in time for the anniversary of martial law this September,” he said. 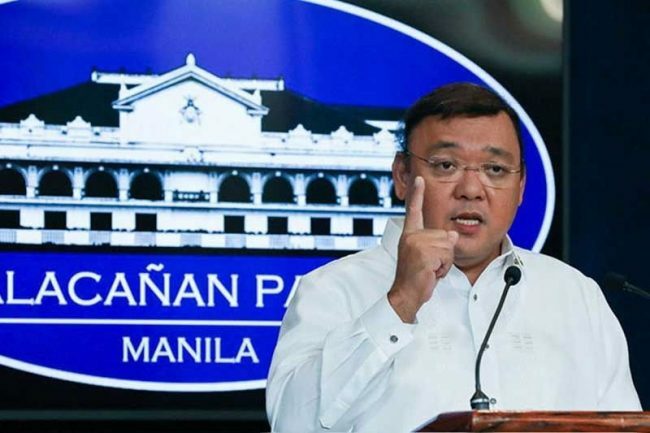 Despite this alleged threat, Roque said he was optimistic that no plot by the president’s opponents would succeed due to the continuing popularity of the president. “With the huge mandate given by the people to President Duterte, their threats, their plans would not prosper,” he said. As we reported on Saturday, public trust in President Duterte has dropped to the lowest of his presidency, although he still maintains a rating of “very good”. Roque alleged that the “yellow forces” were determined to make a return to power since they lost to Duterte in the 2016 presidential elections. The word “yellow” is widely used to describe allies of former President Benigno Aquino III and the Liberal Party. “It is clear to me that the yellows did not accept defeat on election day and since day one they have been planning how to return to power. They are really addicted to power,” he added. The president recently warned that Senator Antonio Trillanes IV was conspiring with the Liberal Party and the communist rebels to remove him from office by October. Trillanes is currently holed up in the senate building after the president ordered his arrest after revoking an amnesty for his involvement in a failed military coup 15 years ago. He claimed that he had received an intelligence report about the supposed coup plot from “sources from a foreign power”. As we reported in December 2016, the former US ambassador to the Philippines, Philip Goldberg, was accused of writing a blueprint for a plot to topple the president. The existence of a “Goldberg Plan” was denied by the State Department. Senator Francis Pangilinan, president of Liberal Party, has denied the President’s allegation, emphasising that dissent was not destabilisation. He said the government was already doing a good job destabilising itself through its alleged incompetence and corruption.